I've taken to making pizza for dinner once a week. Hip hip for my new favorite tradition. I start with PW's crust recipe and then go crazy from there. If you haven't tried PW's crust, I recommend you hop to it at your earliest convenience. I've made it at least a half dozen times and it has come out perfectly every time. And for someone who has earned some notoriety in the past for ruining bread this is a big deal. Obviously we like our pesto around these parts. :: I like to let the dough rise right in the bowl I've been mixing it in. I used to move it to another bowl until I realized it was pointless and just left me with another bowl to clean. :: If your house is on the cool side, putting your dough in the oven with the light on will generate enough heat to facilitate rising. Just be sure not to pre-heat your oven when the dough is still rising in there like N8tr0n did last night! Bummer. Good thing we had extra dough in our stash! :: The dough can be a little tough to stretch out at first. Be patient and keep working it. The thinner this crust is, the better. :: Baking the pizza with the rack on the lowest setting is crucial for maximum cheese browning and crunchy crust. So. Do tell. What is your favorite pizza topping? Anything that we must try? Also, want to come over for pizza? P.S. Thank you for all of the get-well wishes! Things are definitely looking up in the head cold department. And if the boisterous sounds I heard coming from Z-cakes' room weeeeeell after bedtime are any indication, I think she is on the mend too. I made pizza with PW crust last night! Love it. I don't bother with two bowls either. Barbecue chicken pizza is our favorite, but we also love Hawaiian. Last night I made potato with rosemary and garlic and it was pretty delectable as well. I love this crust... and that CPK recipe is my all time FAVORITE! Yum. I think we will have pizza tonight. You are such a smarty pants with that pizza stash. WHY do I read your blog when I'm hungry? I must try that recipe! And yes. I do want to come over. Thanks! My favorite pizza is fresh basil and tomato. Seriously delish and simple. You are a pizza genius. Thanks for the tip. ***I'm serious about getting together when you come up if you have a spare moment. I totally am excited to meet you. A well-loved topping in our hacienda: sun dried tomatoes. And yes, I would love to come over for pizza. Mmm! We love olive oil with artichoke hearts, spinach, red pepper (roasted or un), roasted garlic, goat cheese, sauteed zucchini - homemade pizzas are the best! We love homemade pizza. Red pepper, mushrooms, onions, fresh pineapple are all delicious. We like to top our hot pizza with fresh basil. I love your shower, thanks for the Amy Atlas link. I spent a delightful hour lusting over her 'eye candy'! I love the Halloween table. Especially the paper bag pumpkins and candy corn cookies. I enjoy your blog! Mmm...'Twould be well worth the trip. Mmmm....pizza. 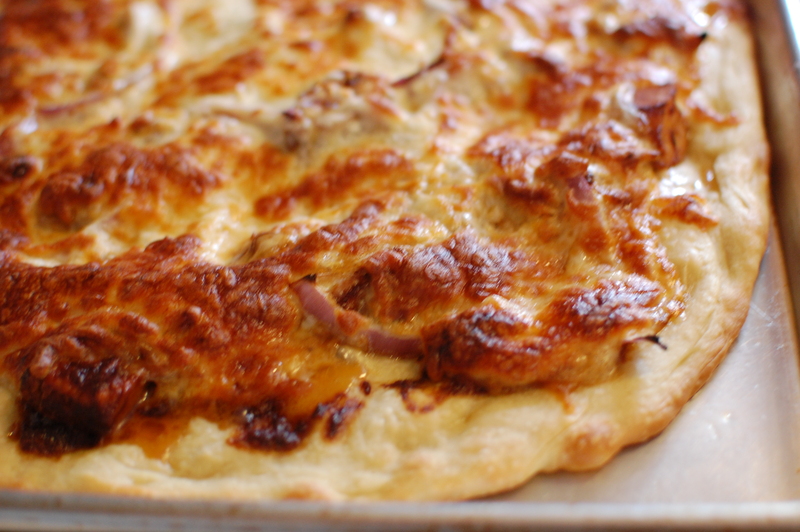 I also love the CPK BBQ Chicken pizza! I don't usually get to put everything I would want to on pizza or my husband wouldn't eat it. He is very much a traditional/anti-vegetable kind of guy when it comes to pizza. I like making individual pizzas so I can do my own thing while he looks at me like "you're seriously putting THAT on your pizza". My absolute favourite is Caramelised red onion, spinach and goats cheese on a really thin base. Hey lady! I went to high school with your hubs and he found his way over to my blog recently - I LOVE yours! Makes me excited to be a mom someday. You guys have a gorgeous family and it's fun to see what N is up to these days.